A brand story is essentially – to use an equally unenlightening term – a company narrative, not necessarily the tale of the company’s miraculous founding back in the mists of time (when people without smartphones roamed the earth) but a story which represents where the brand is – its positioning at any given time. So, though not quite at a ‘this is’ stage, we will say that a ‘brand story’ is not a company history (though this can be part of it). A brand story is equally more complicated, less concrete and more useful than a history – because it changes according to the needs of the business and can be as much a part of the marketing process as the product itself. 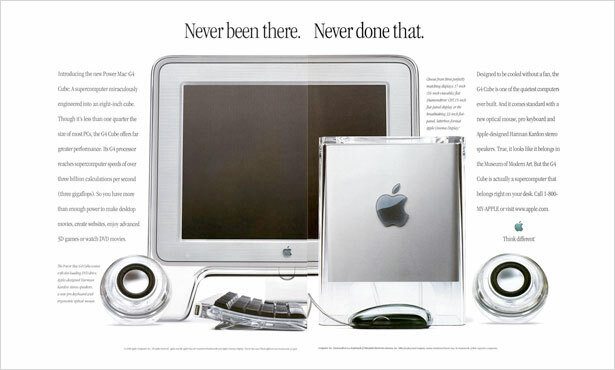 It can be viewed as brand aspiration – the story a brand tells itself as much as its consumers (think of the mythos Apple has created for itself – a liberal, slightly nerdy, slightly eccentric, but cutting edge company riding a technological new-wave). A brand story is a marketing tool, of that there is no doubt, but the best and most useful stories are those which speak to a brand’s consumers – these are not persuasive narratives, they are descriptive, aspirational, conversational narratives that speak directly to a target demographic and which aim to intrinsically bind a product or service to that demographic or to an activity that it enjoys watching or in which it participates. The importance of this in the positioning of a brand can be seen in the proliferation of role creations at high-profile brands such as: ‘Chief Storyteller’, or ‘Brand Voice Manager’. Although brands such as SAP and Nike employed such an individual as far back as the ‘90’s, the shift of power from purveyor to purchaser that began with the very first free AOL discs dropping through people’s letter boxes and has continued to gain momentum since, has led to a need to create conversations with consumers, and this is where these storytellers come in. The best way to explain this is probably by illustration through an example, and one of the best examples of this variety of evolution (and how little a brand story has to reflect historical origins) is probably Pepsi-Cola – so called in honour of predominate ingredients, pepsin and kola nuts. Pepsi entered the soft-drink market in 1898 (after a brief period as ‘Brad’s Drink’) before embarking on a long and painful lesson in ‘how not to advertise’ that, in addition to some poor business decisions, culminated in its becoming bankrupt in 1923. These include the use of a slogan almost but not quite borrowed from Coca-Cola – while Coke began using ‘Delicious! Refreshing! Exhilarating! Invigorating!’ in 1886, Pepsi followed in 1903 with ‘Exhilarating, Invigorating, Aids digestion’. It uses some of the same words, sure, yet the addition of ‘aids digestion’ cannot help but turn what, for Coke, was a brand statement that promised excitement from a novel new soft-drink, into something that conjures images of the digestive process and all that that entails. So, though only changing two words, Pepsi managed to miss targeting a generation of Americans with disposable incomes and instead seemed to position itself as a bowel loosening medical aid for that target market’s parents. 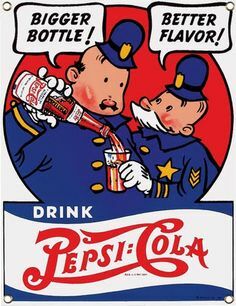 This wasn’t the last seeming misunderstanding in Pepsi’s early years, however, in fact Pepsi seemed to fail to value advertising as much as its main competitor and while Coke’s advertising budget reached $1million in 1911, it took until 1936 for Pepsi’s to reach half that. While Pepsi was running slogans such as: ‘Delicious and Healthy’ and ‘Drink Pepsi-Cola. It will satisfy you.’ Coke was already positioning themselves as market leaders with adds directly addressing the subordinate nature of competitors: ‘Call for it by its full name, nicknames encourage substitution.’ Pepsi became simply a cheap alternative, with stories circulating about housewives decanting Pepsi into Coke bottles to avoid the scorn of house-guests. 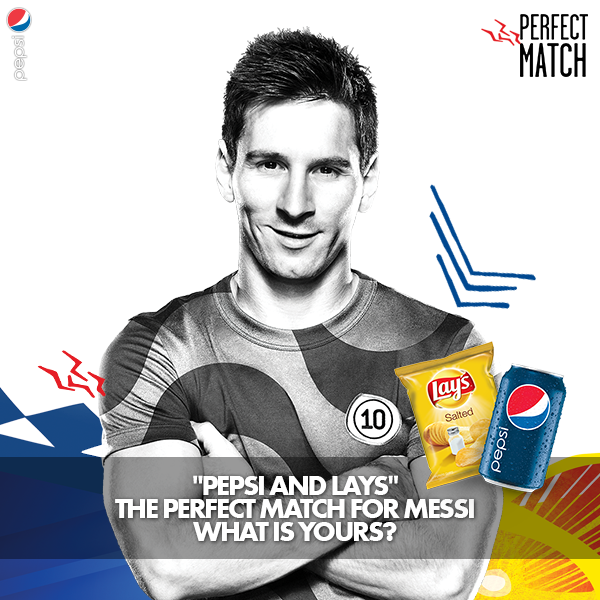 In this way the brand found its voice and began a narrative inextricably tied in to youth culture and youthfulness which extended to include sponsorship of major sporting events and advertising runs featuring world-wide names in sport – with Lionel Messi, Robin van Persie, Sergio Aguero and others featuring in advertisements during the 2014 World Cup. This really goes to the heart of the ‘brand story’ concept – PepsiCo’s story is fluid, regularly updated, and speaks to consecutive generations and iterations of youth culture, marketing the brand as caring passionately in the pursuits and dreams of its target demographic – or as one of the World Cup adverts stated: ‘Pepsi celebrates the passion and energy of football fans’. This is the key to developing a brand voice – especially and increasingly since the advent of the internet. It is no longer enough to pitch a product at a specific audience, but to become a part of it, to become associated with a way of life lived by a target audience. Just as Pepsi has become synonymous with musicians and music, with sports and sports persons, it is necessary for your brand not to speak to, but to speak with its consumers. Across all markets you will see examples of this approach from the most successful brands – whether it is Apple, or Pepsi, The NME, Vodafone, Oreo, John Lewis or any of a host of other major brands, they are pitched as a part of a specific lifestyle. This represents a change in approach from ‘aspirational’ to ‘realisation’ advertisements – it is no longer the case that brand’s marketing activities say ‘Use this and you could be’, they say ‘If you use this, you are.’ If you drink Pepsi you are energetic, sport loving and youthful, if you buy Apple products you are a technology expert, a smart and active socialite, if you buy The NME you are cool and rebellious – and on and on. It is here that a chief storyteller or brand voice manager will earn their living – as Gary Vaynerchuck has said, you ‘cannot underestimate people’s ability to spot a soulless, bureaucratic tactic a million miles away’. In order for your brand’s story to resonate with your consumers, it must adhere to the same rules as all other stories, it must connect with them, teach them or make them laugh, it must be authentically told in a voice uniquely belonging to your brand and consistently represented in all areas of communication. Those of you signed up to the Inbound.org newsletter, for example, will have seen a recent shift in tone following a transition of its delivery from automated to human controlled. Equally you’ll see Moz’s funny and slightly irreverent tone reflected across the board, while you’d be hard pressed to know that Red Bull was an energy drink based on its website – instead it is a site which advertises a lifestyle of daredevilry and high intensity sport. The phrase ‘brand story’ is an umbrella term for a host of other brand elements, a rebranding exercise embodying the importance of consistency in vision and ambition for a brand. It is not a Wikipedia timeline, or an aspirational by-line, it is the meat and drink of a brand’s identity at a time when consumers increasingly look to brands for interaction and are ever more discerning when it comes to choosing brands that they feel fit with how they view themselves, whether this is holiday providers, manufacturers of their smart phones, or their choice of alcoholic or caffeinated beverage. Be honest, be open, be genuine and look to love what your audience loves and it will not only be a story which your brand tells, but one which your consumers will retell on your behalf. To find out how we can help you to find your voice and tell your story, contact us today.